Under the auspices of the Euromech Committee, the Fifth European Turbulence Conference was held in Siena on 5-8 July 1994. Following the previous ETC meeting in Lyon (1986), Berlin (1988), Stockholm (1990) and Delft (1992), the Fifth ETC was aimed at providing a review of the fundamental aspects of turbulence from a theoretical, numerical and experimental point of view. In the magnificent town of Siena, more than 250 scientists from all over the world, spent four days discussing new ideas on turbulence. 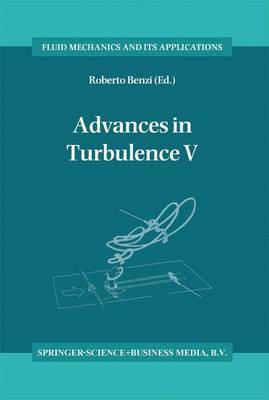 As a research worker in the field of turbulence, I must say that the works presented at the Conference, on which this book is based, covered almost all areas in this field. I also think that this book provides a major opportunity to have a complete overview of the most recent research works. I am extremely grateful to Prof. C. Cercignani, Dr. M. Loffredo, and Prof. R. Piva who, as members of the local organizing committee, share the success of the Conference. I also want to thank Mrs. Liu' Catena, for her invaluable contribution to the work done by the local organizing committee and the European Turbulence Committee in the scientific organization of the meeting. The "Servizio Congressi" of the University of Siena provided perfect organization in Siena and wonderful hospitality. The Conference has been supported by CNR, Cira, Alenia, the Universities of Rome "Tor Vergata" and "La Sapienza".